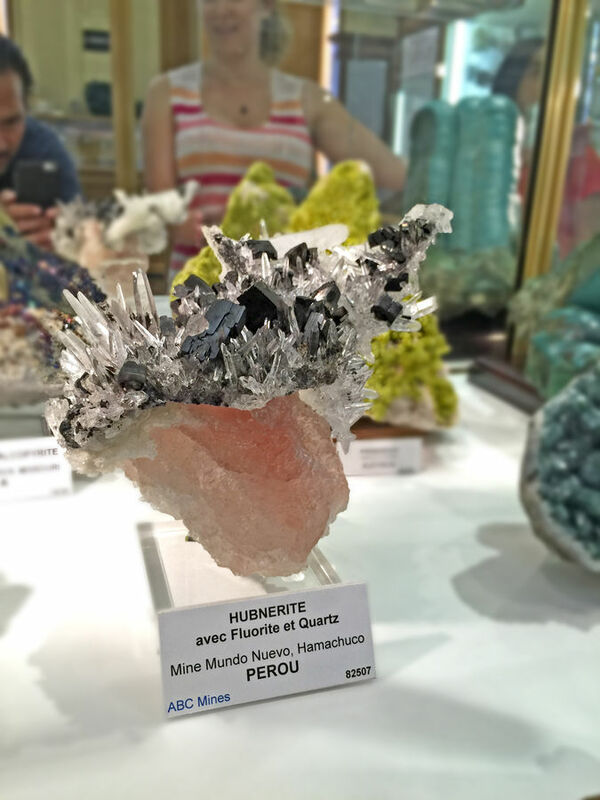 Right after the 2015 Sainte-Marie-aux-Mines Show, I spent a few days in Paris visiting some of the mineral museums there. 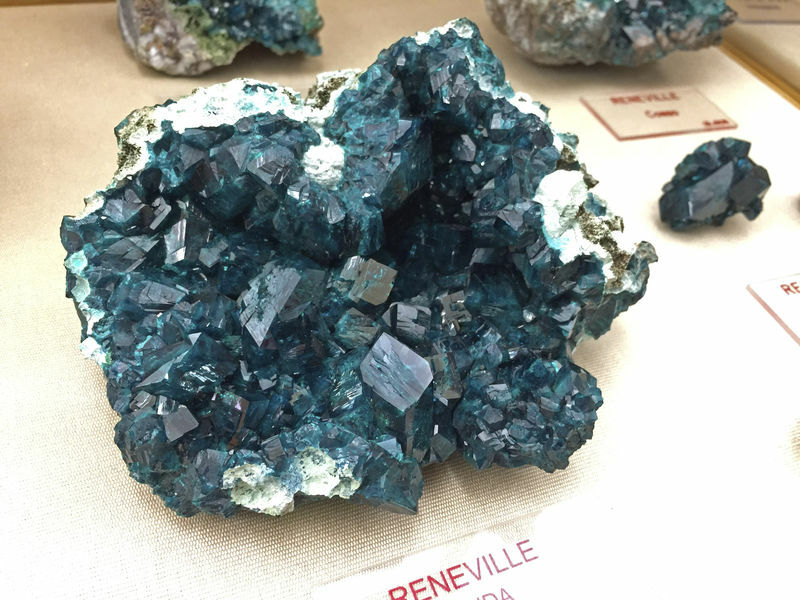 I took a bunch of photos of the displays and the minerals as notes to myself for an upcoming film series I'm planning but then thought I might as well share these "reference shots" with the rest of the mineral community. 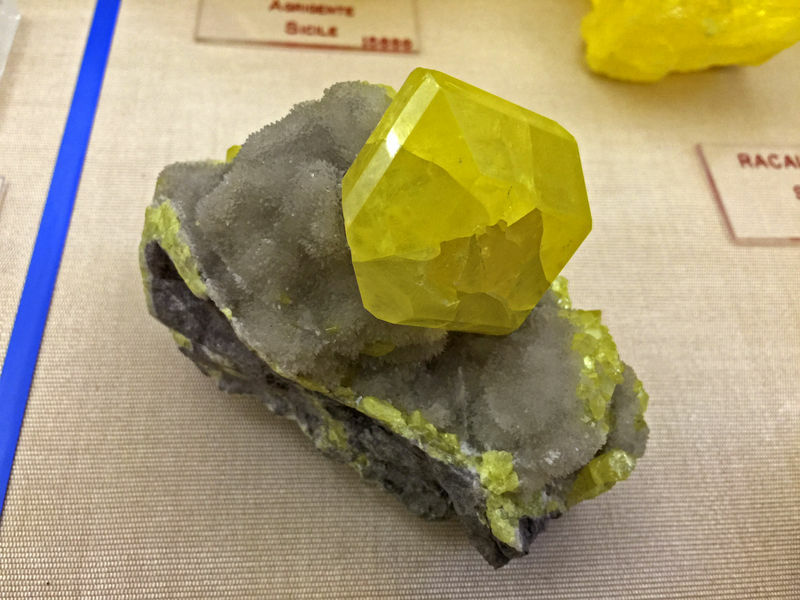 Keep in mind that these are A) what I consider low-resolution and low-quality shots as they were designed only as a visual reference to myself, and B) ONLY of mineral specimens on public display - any pieces shown to me that WERE NOT on display are not included. My first stop was the Paris School of Mines right in the Luxembourg Gardens. 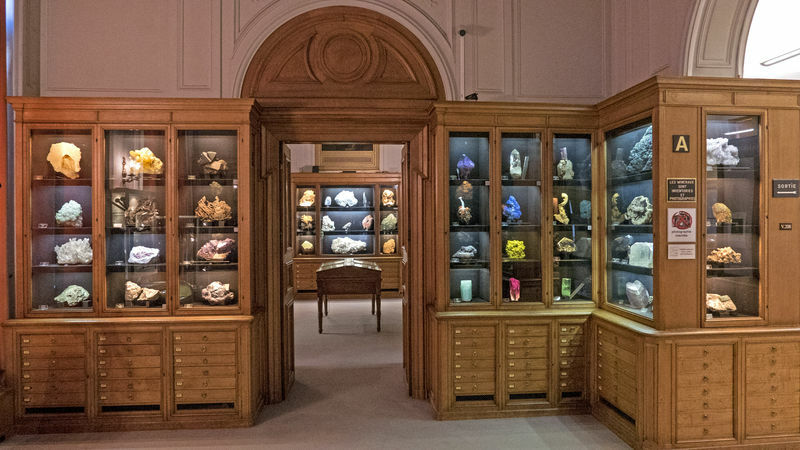 I want to thank the new Museum Curator, Eloise Galliou (formerly from the Natural History Museum of Los Angeles), for inviting me in and letting me wander around. 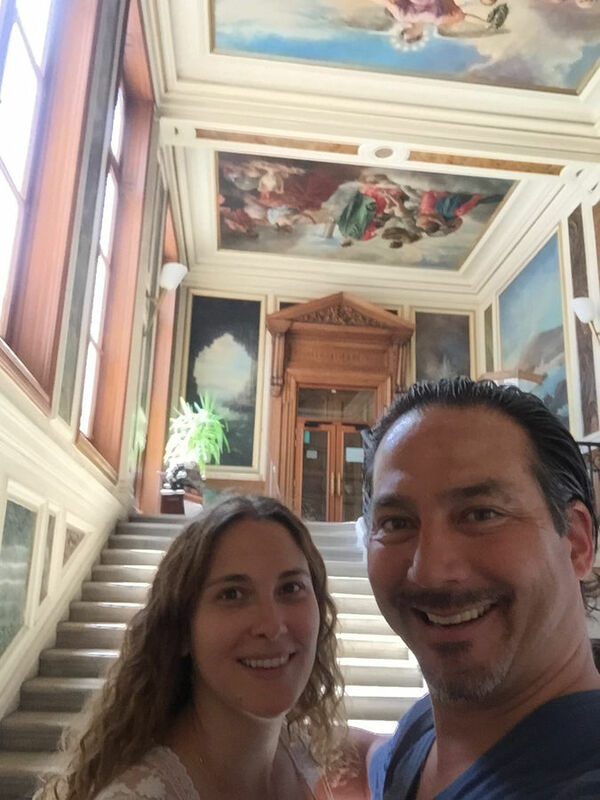 Eloise and I in front of the 2nd floor entrance to the School of Mines Museum. Sorry. I'm being exceptional dumb today as I try to figure out how to upload multiple files. This is the view right after you enter the School. Here's a view looking down the hall of the School. 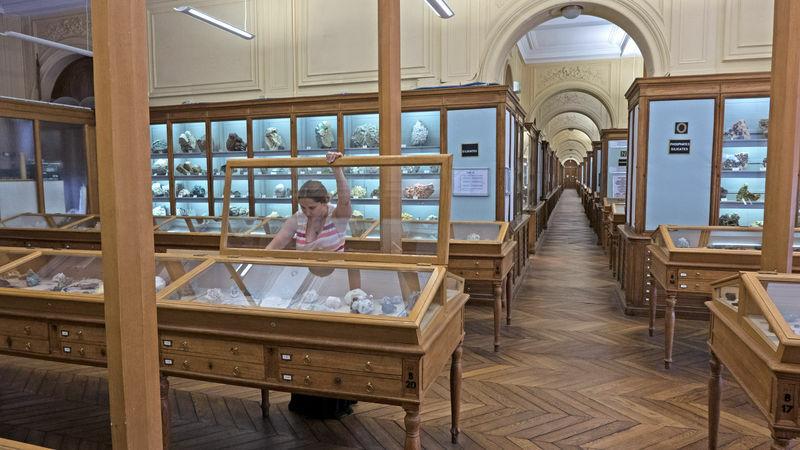 Eloïse Gaillou can be seen here returning some of the specimens to the display after the Sainte-Marie-aux-Mine show. The sitting room at the School. Now...the mineral shots. Roughly in alphabetical order. 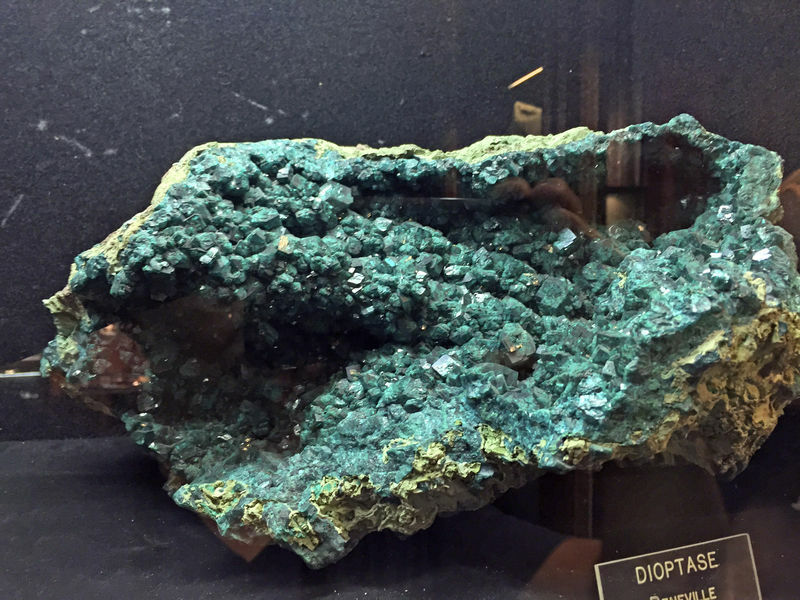 A huge Adamite diorama that I was shocked to see. Mapimi, Mexico. 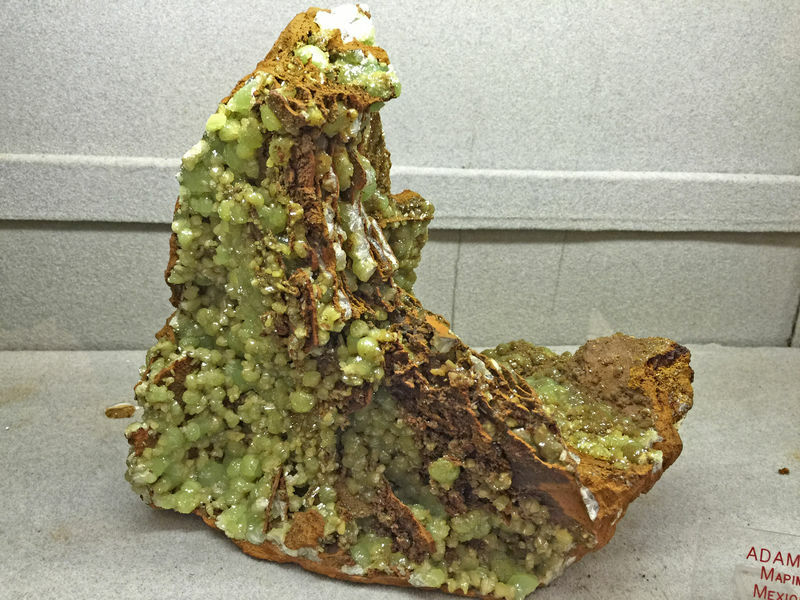 Another angle of the Adamite diorama from Mapimi, Mexico. 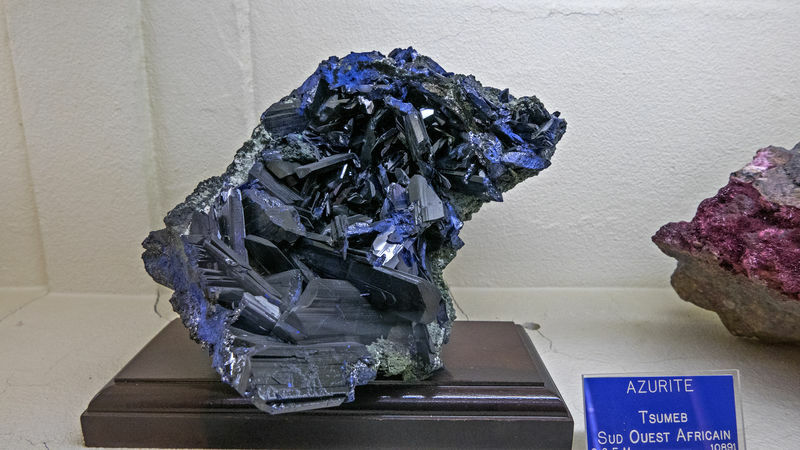 Azurite from Tsumeb Mine, Namibia. 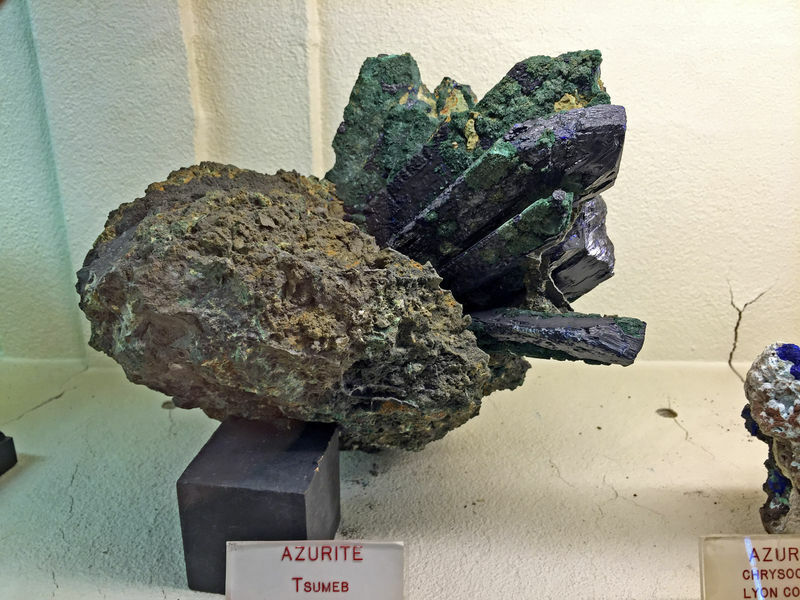 One of the School's many Azurites from the famous Chessy Mine in France. 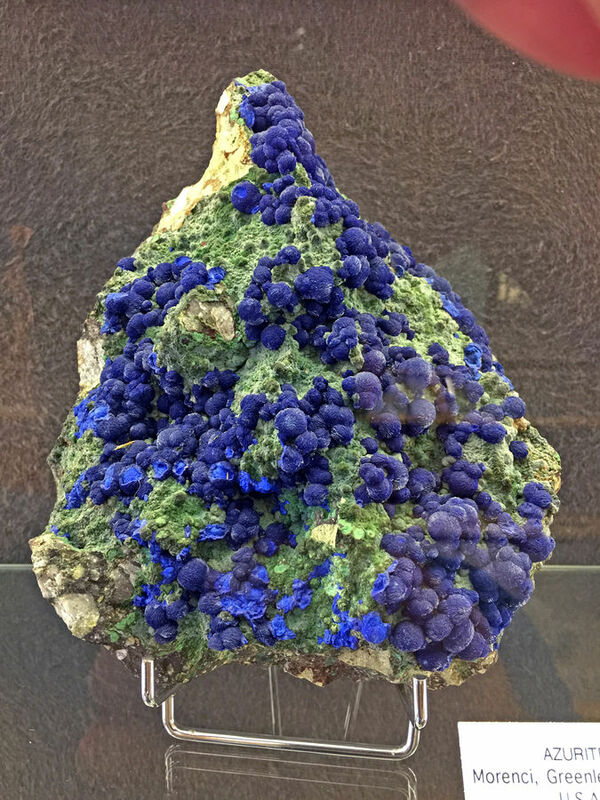 I've never seen an Azurite like this from the Bisbee Mine, Arizona, USA. 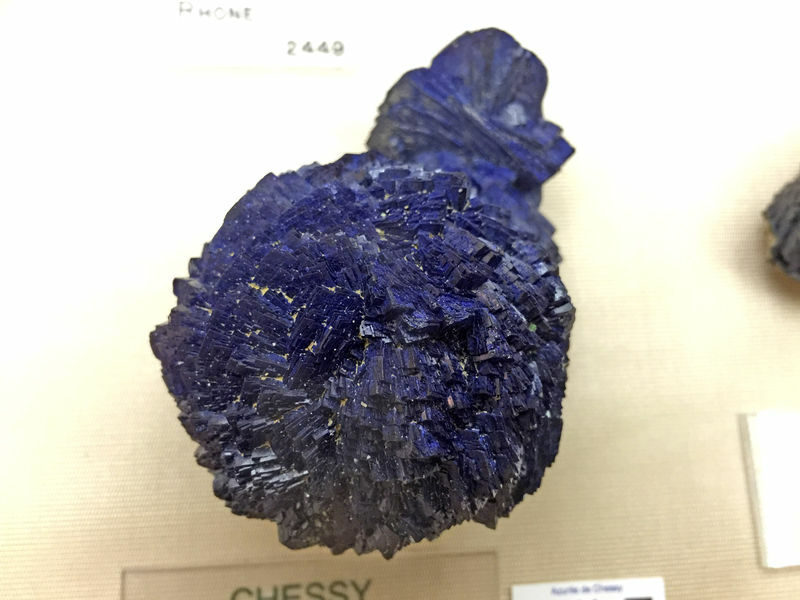 Another Azurite from Bisbee, Arizona, USA. 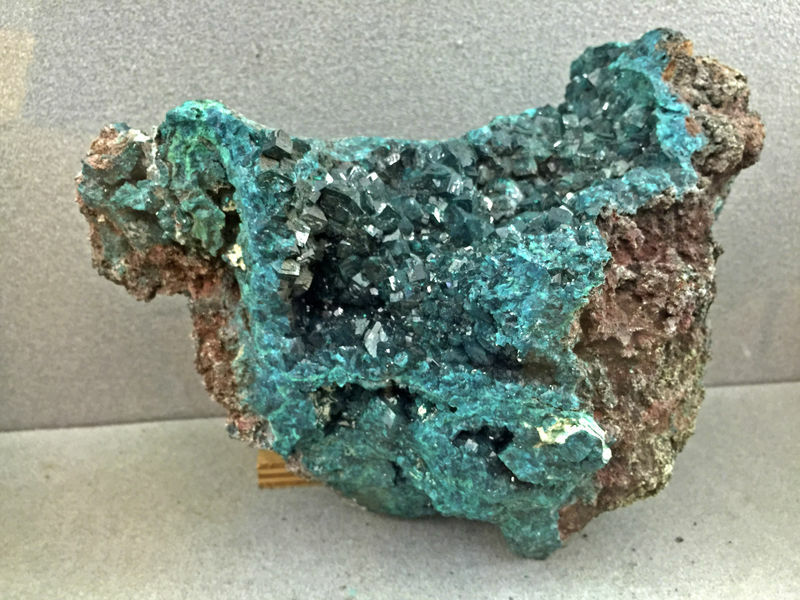 A plate of botryoidal Azurites from the Morenci Mine in Arizona, USA. 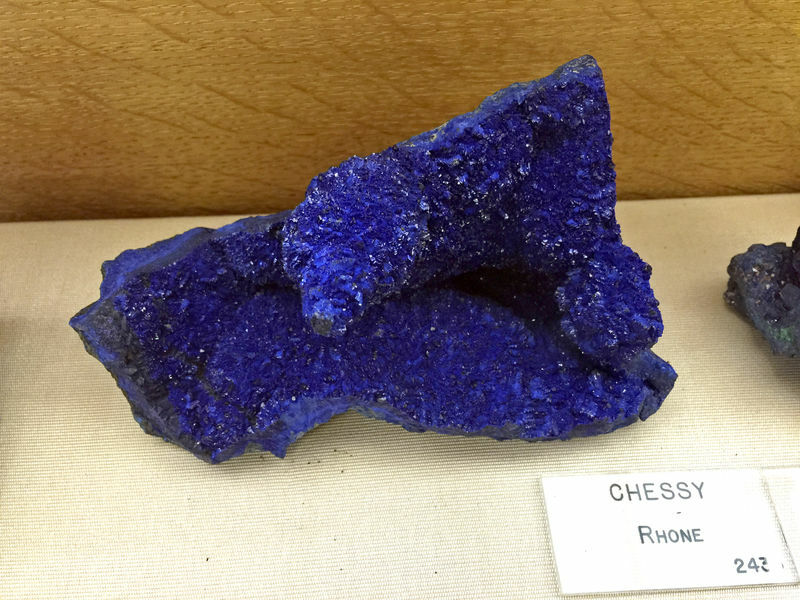 Azurite rose from the Chessy Mine in France. 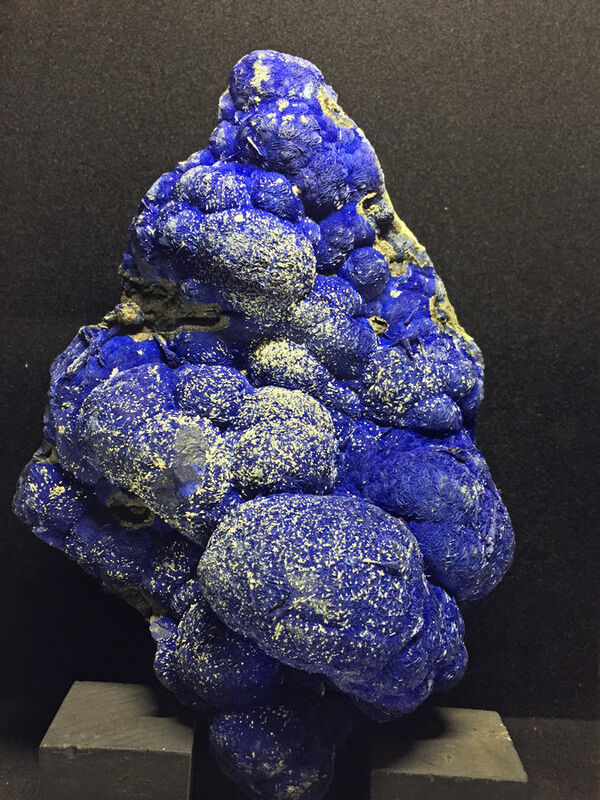 Azurite from Chessy Mine in France. 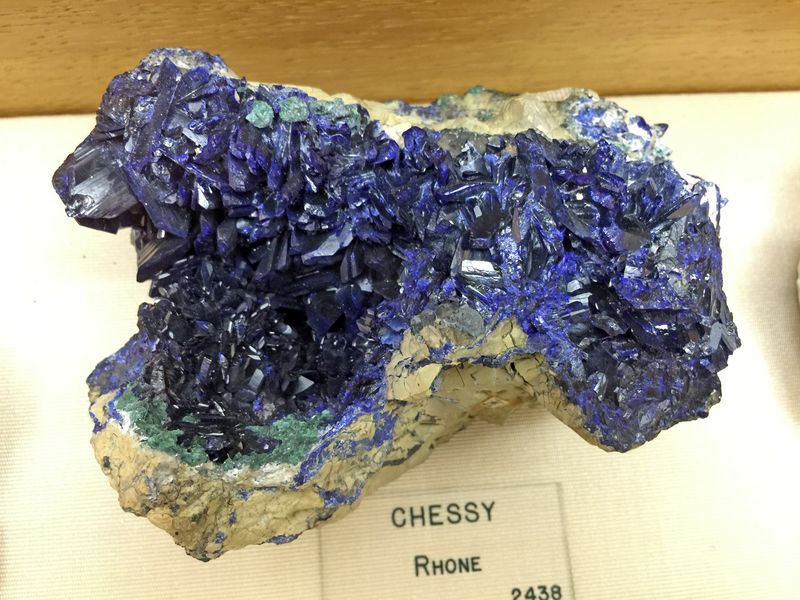 Nice big plate of sharp Azurite crystals from the Chessy Mine in France. 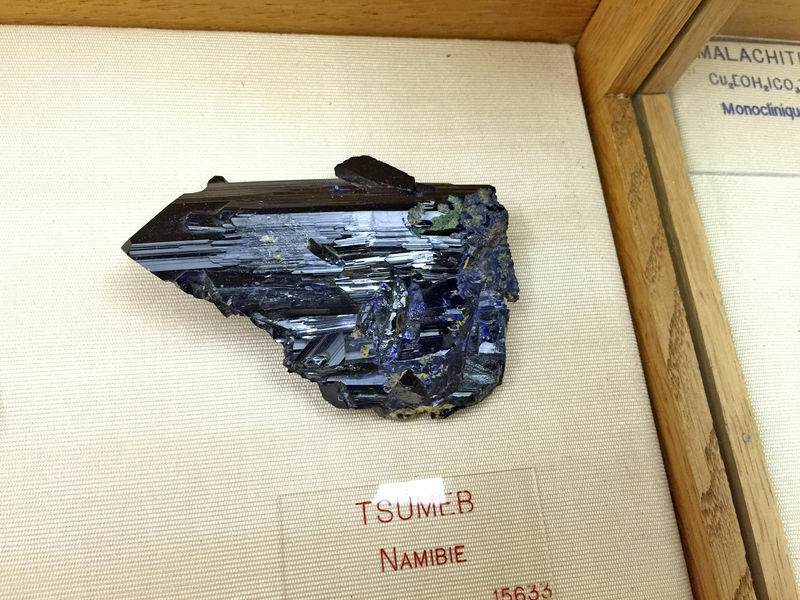 Huge Azurite crystal from the Tsumeb Mine in Namibia. 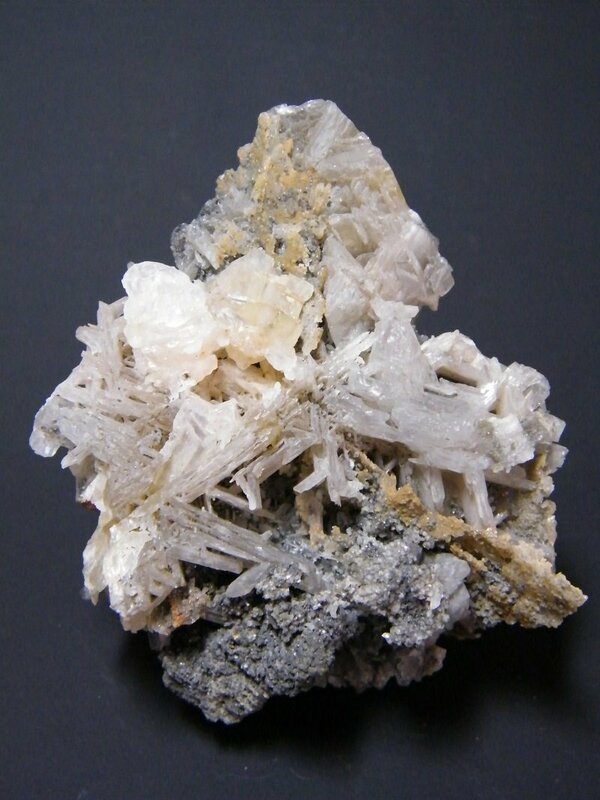 Large specimen of Baryte crystals from Morocco. 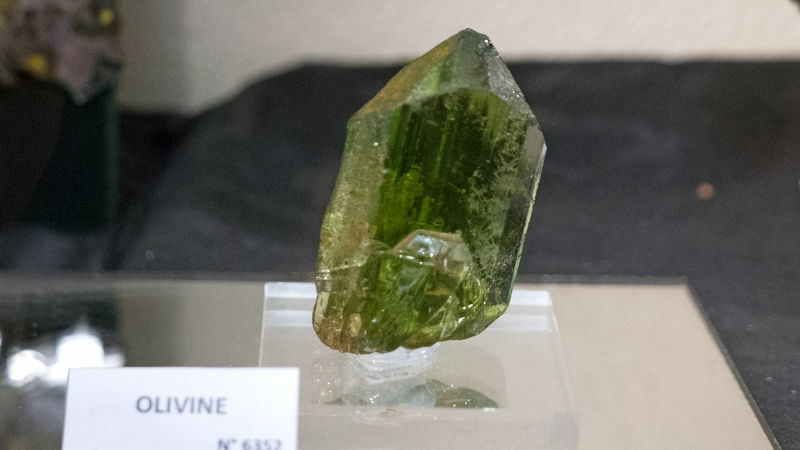 A LOT of the historic specimens from the School of Mines are LARGE pieces as that was the focus of their founding fathers. 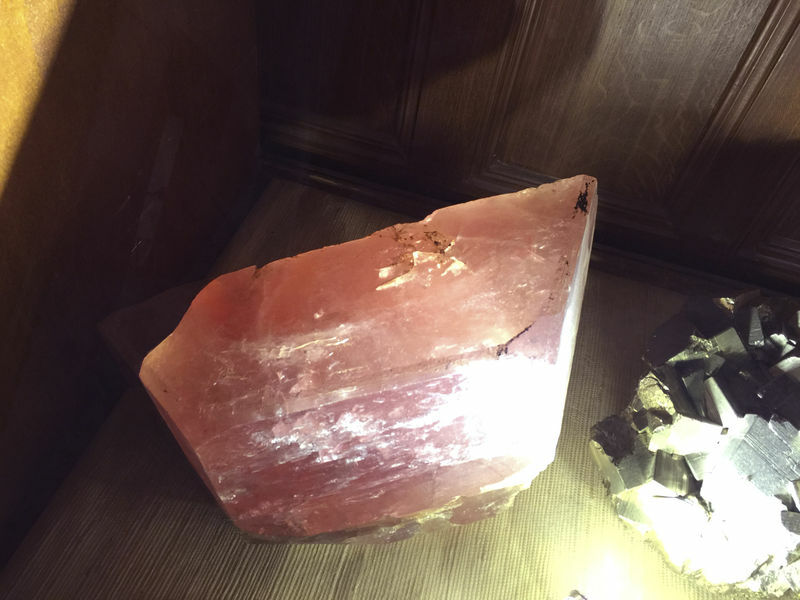 ENORMOUS crystal of Brazilianite on exhibit in the entry way. Brazil. Crocoite specimen from the Dundas region of Tasmania, Australia. Notice the INTENSE red color. 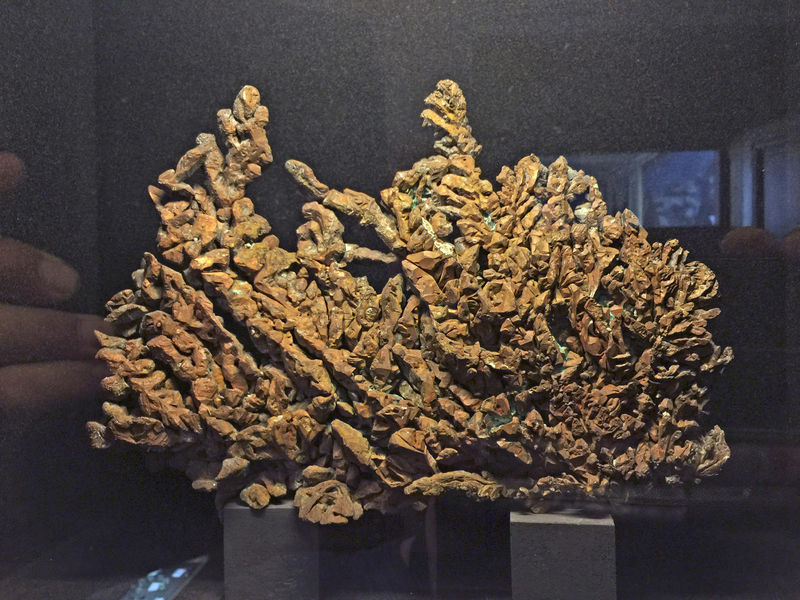 Probably from the Red Lead Mine. 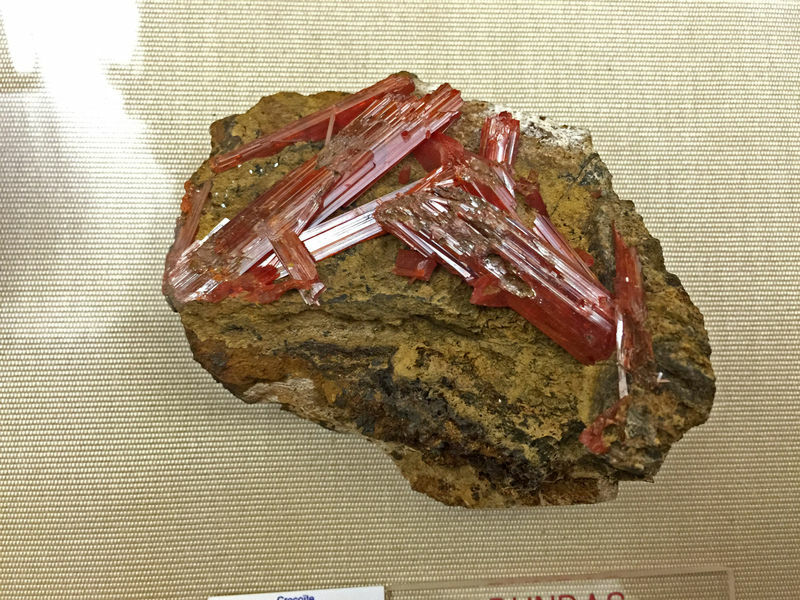 Large, intense red, crystals of Crocoite from the Dundas region on Tasmania, Australia. 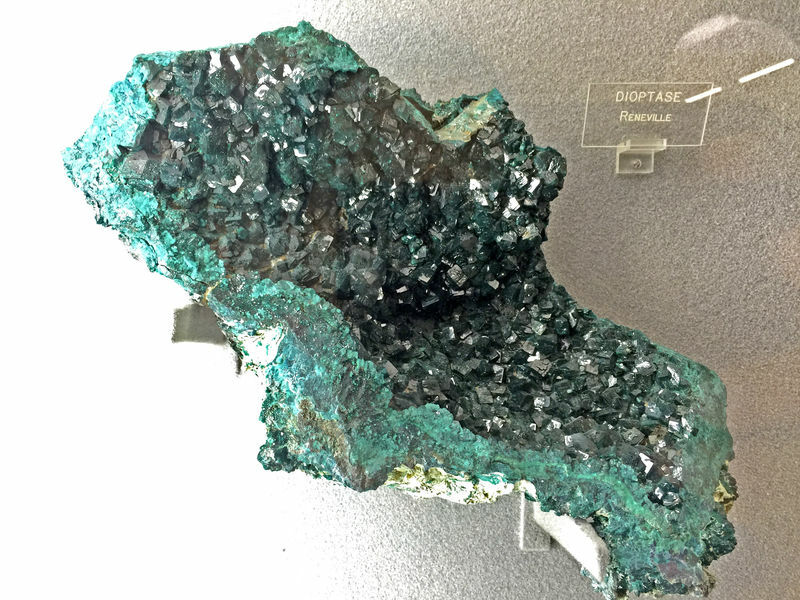 The mine is not noted on the label but most likely the Red Lead Mine. 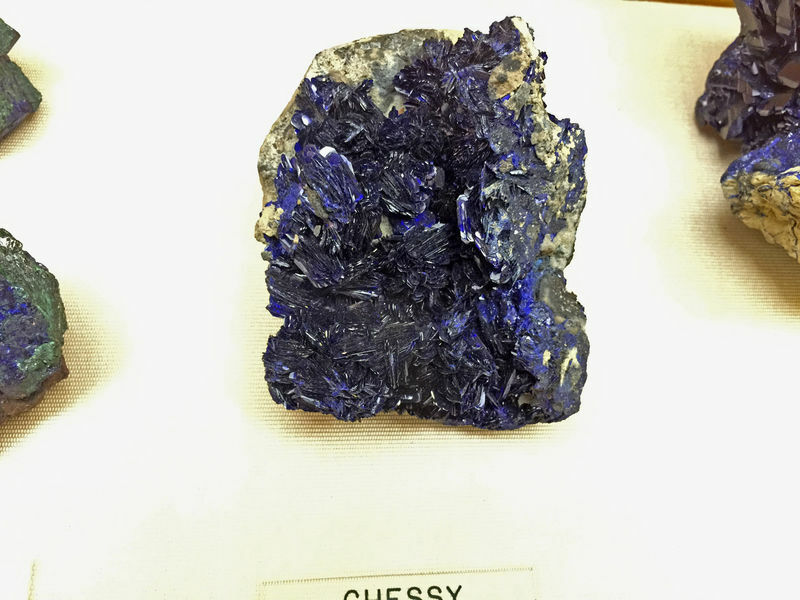 The School Of Mines or Le Musée de minéralogie de l'Ecole des Mines is a beautiful historical museum to visit and it is really worth to visit it when you are in Paris. 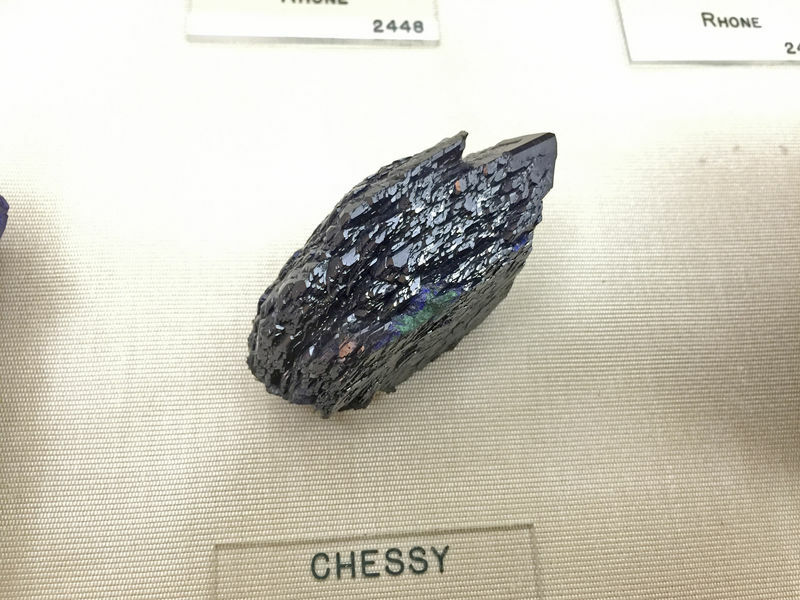 This museum has been on my list of things to do for a long time. Brian's photos just further reinforce why we need to get there. 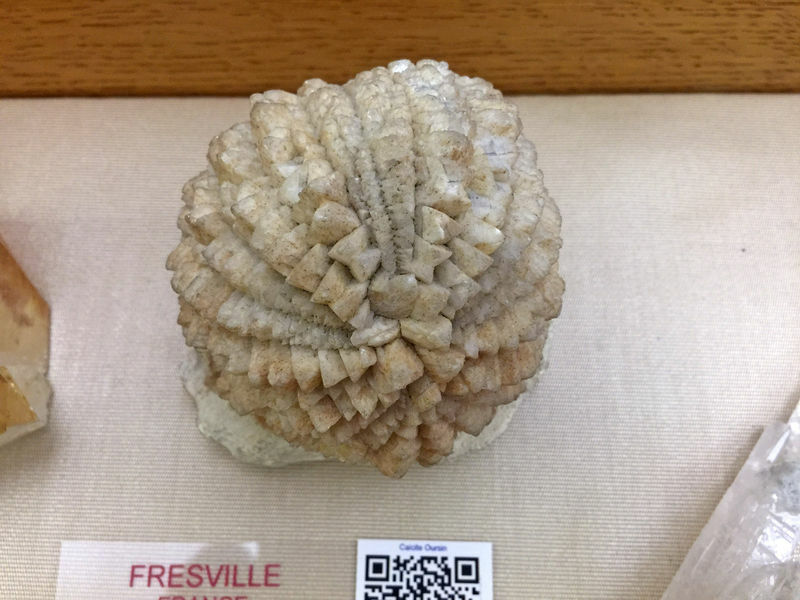 I wish Brian had taken some dimensions of the specimens. 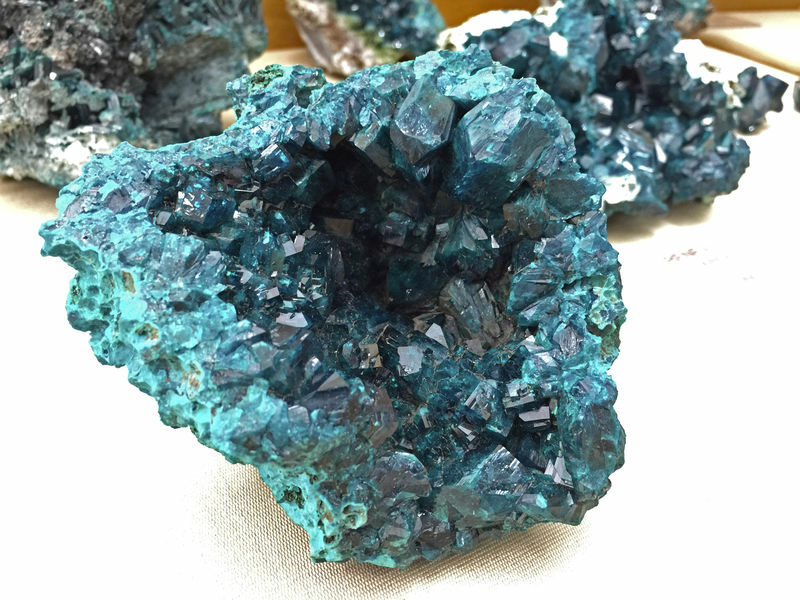 I'll be posting more photos soon (we gotta get all the way to the Wulfentites!!). In the meantime, I'm seeing if I can get dimensions for the pieces. Yes Les, you and Paula really need to go. I had that opportunity several years ago and loved every minute of it. Bryan your pictures came out much better than mine did, but then again the curator at the time was not all that thrilled I was taking pictures. 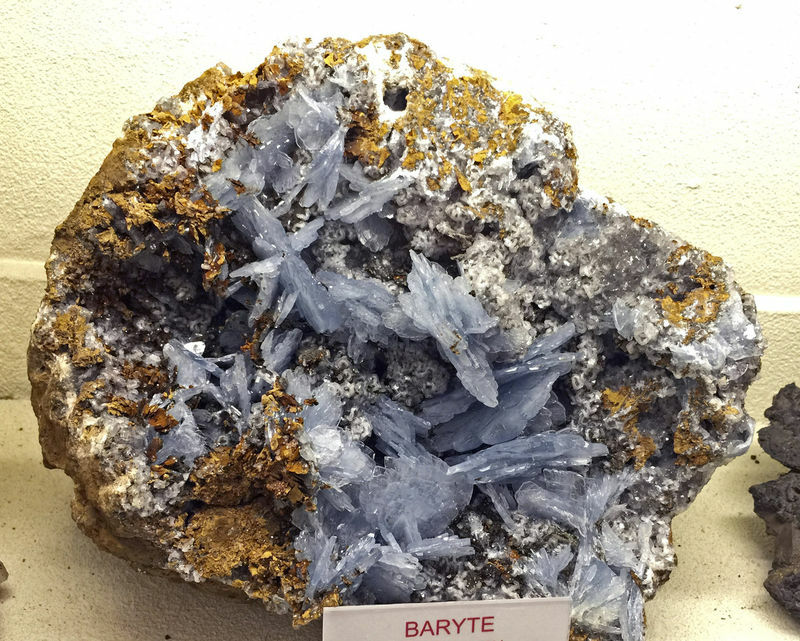 A crazy big set of Danburite crystals with lots of iron oxide staining. Madagascar. 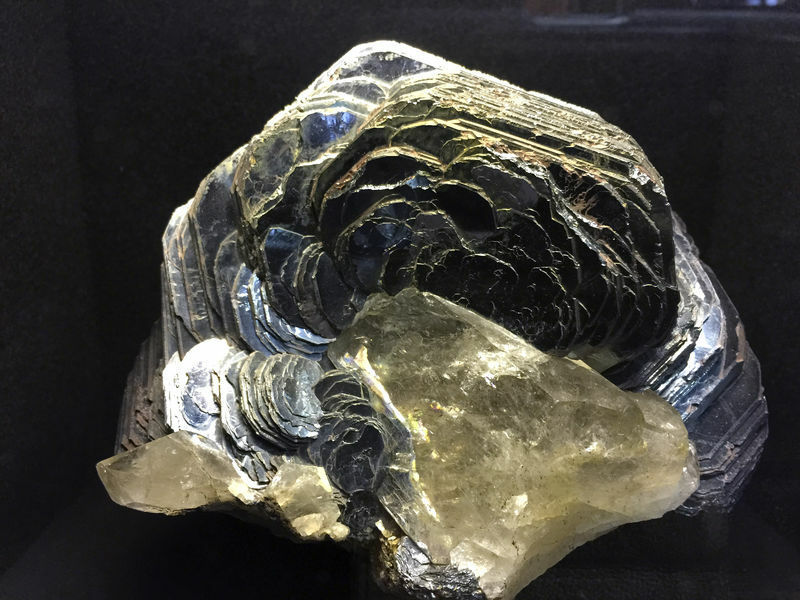 A great Diamond specimen on matrix from Kimberly, South Africa. 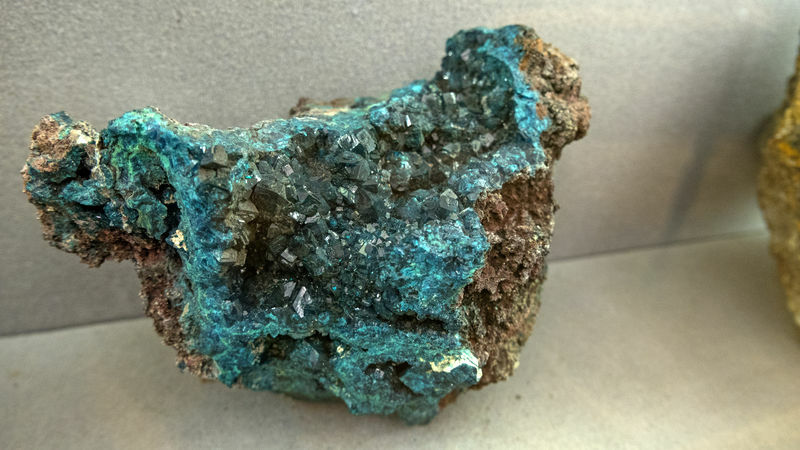 The School has a CRAZY amount of Dioptase from the Republic of Congo (Brazzaville). 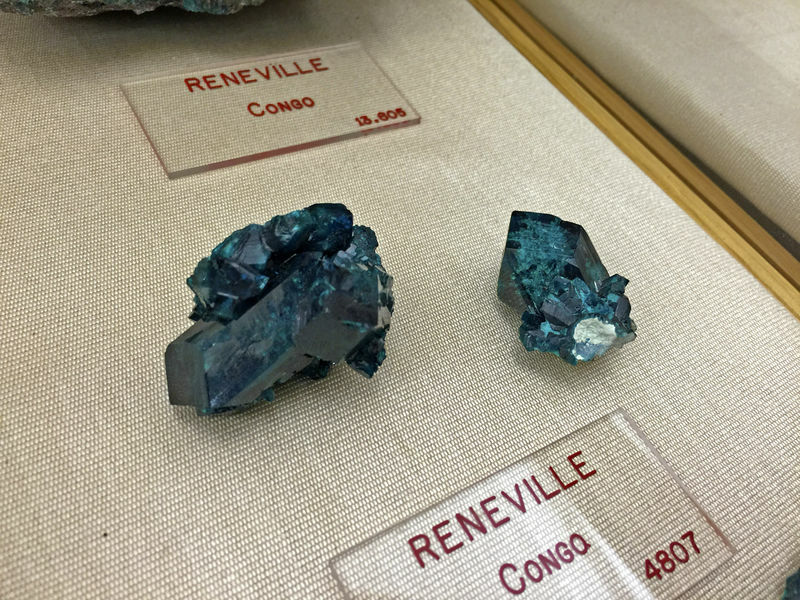 From 1910 to 1958, this area was part of French Equatorial Africa so it naturally makes sense that the Paris School of Mines would have A LOT of specimens from this region. 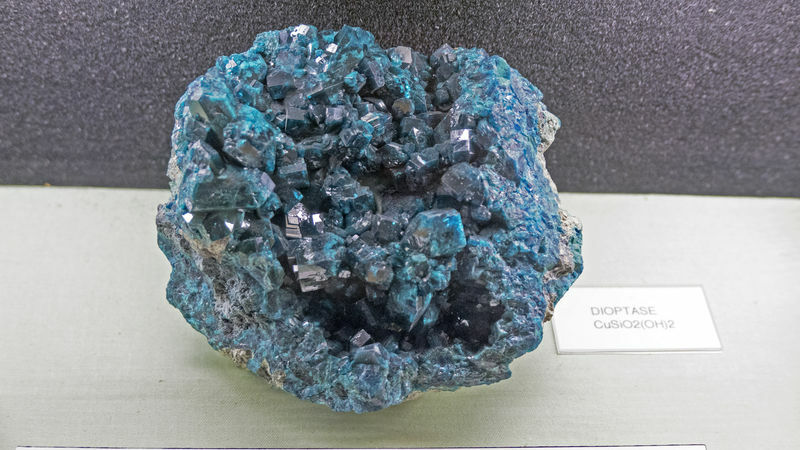 Dioptase - Reneville, Republic of Congo (Brazzaville). 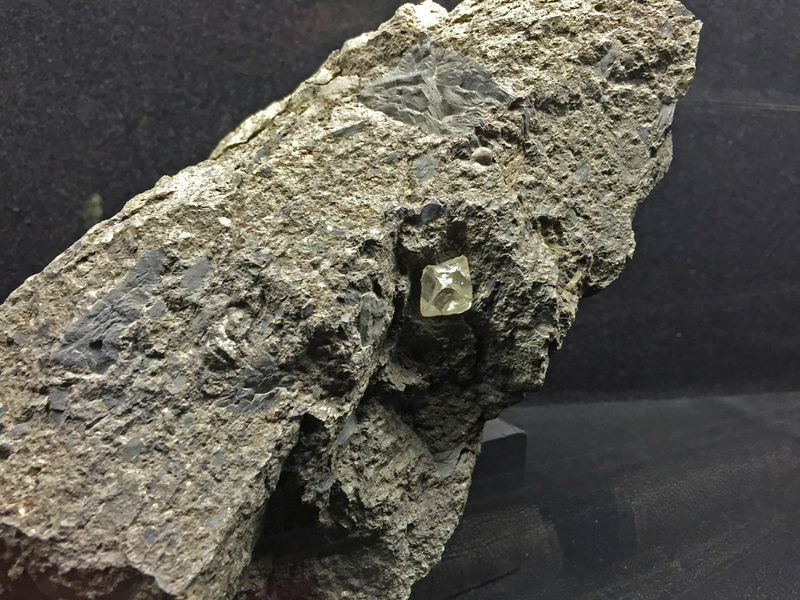 Exceptional diamond on kimberlite. Is it repaired? 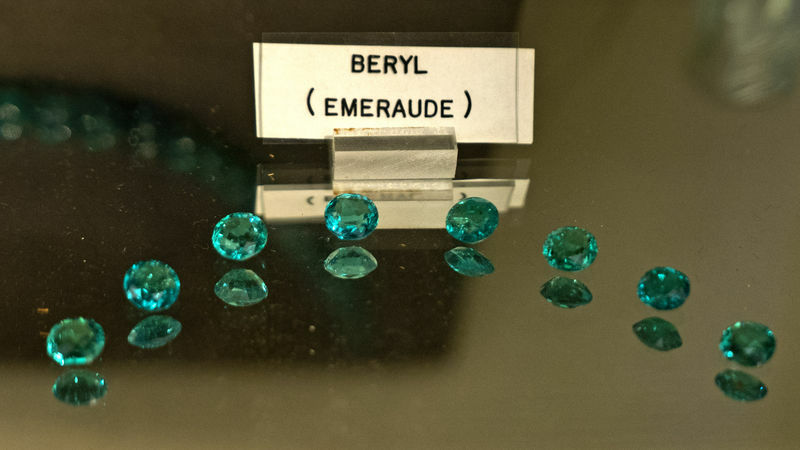 What a suite of Reneville dioptase specimens. 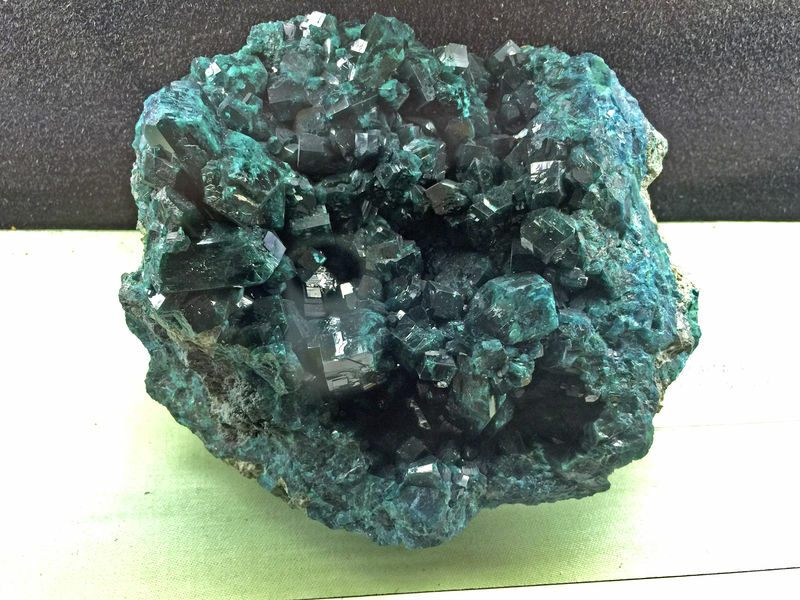 One of my first high priced specimens was a dioptase from here, years before Tsumeb produced dioptase. It was a 8cm by 7cm vug that probably cost me $50, purchased from Jim Mueller, a Phoenix, AZ USA dealer. That was around 1966 or 1967. These are fabulous, especially the 4th specimen. 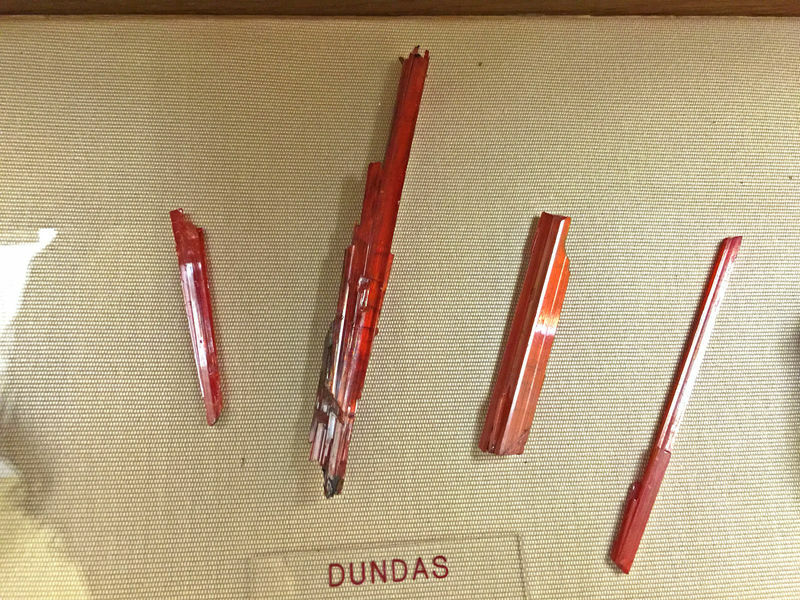 Minerals from the collection starting with the letter E and continuing through to the letter P.
One of their many Erythrite crystals from Morocco. 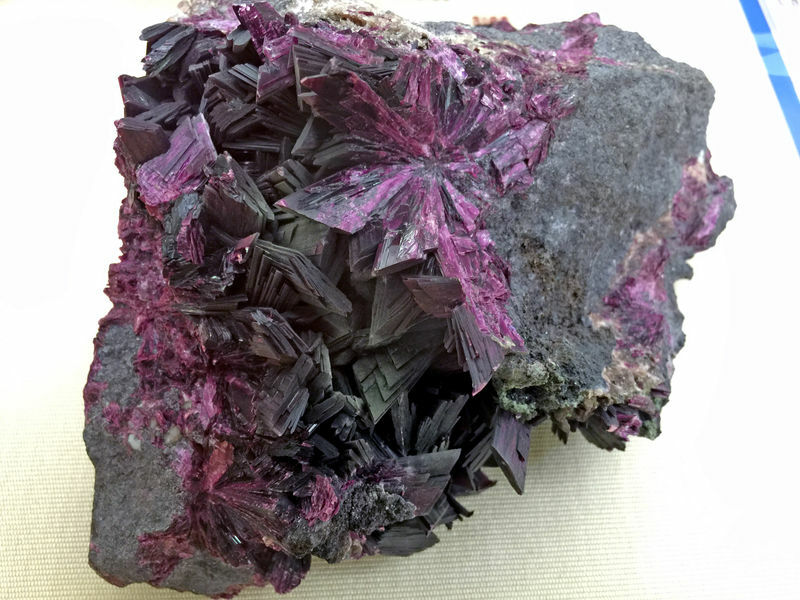 A Hematite Rose from Ouro Petro, Minas Gerais, Brazil. 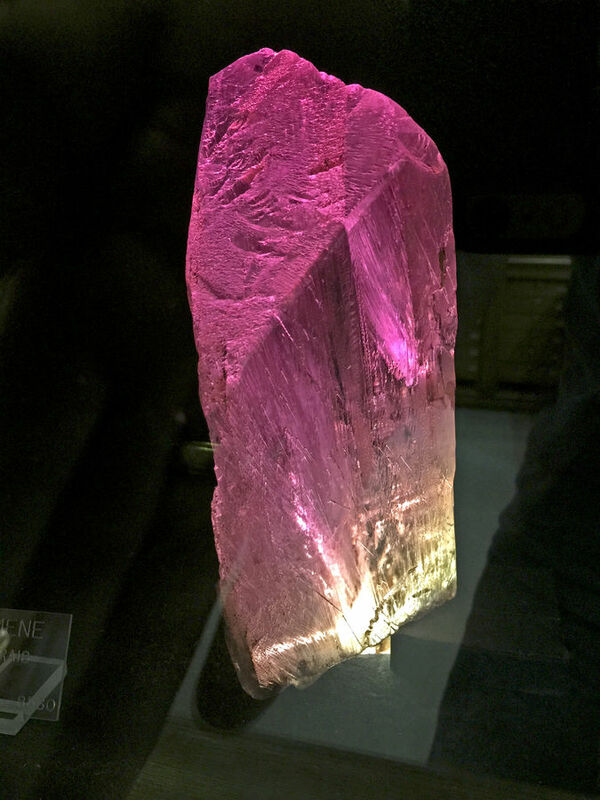 LARGE and COLORFUL Kunzite crystal from Afghanistan. 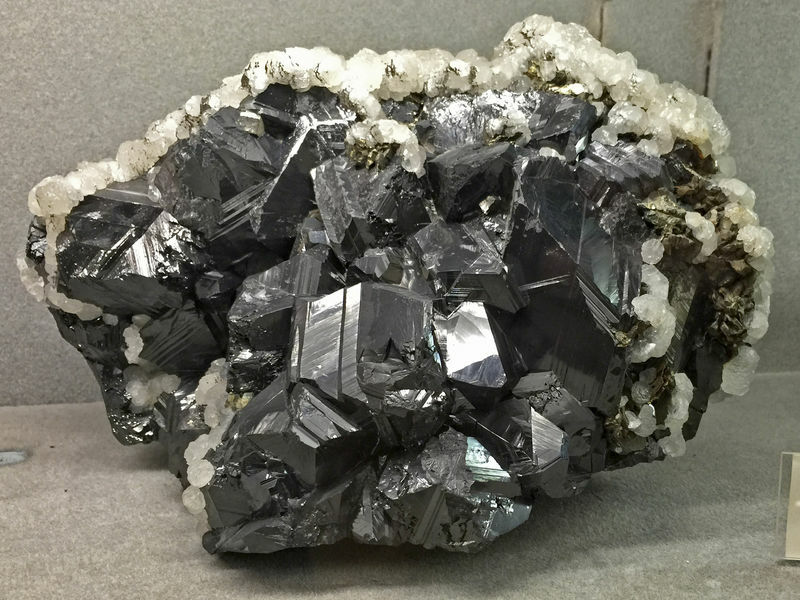 Molybdenite from Madagascar. 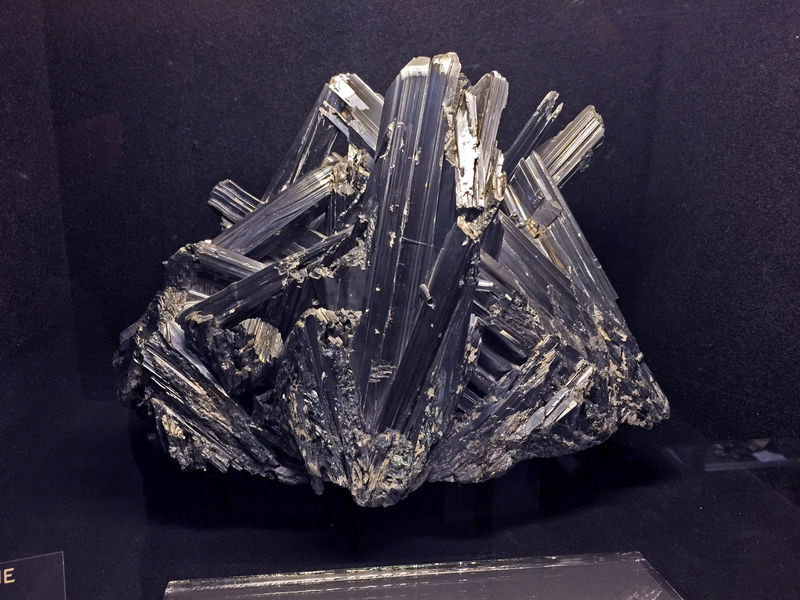 Now, I'm not a mineralogist (so any of you out there please correct this) but my understanding is that Molybdenite is the most common source of the ore Molybdenum which was highly sought after as an industrial flux. 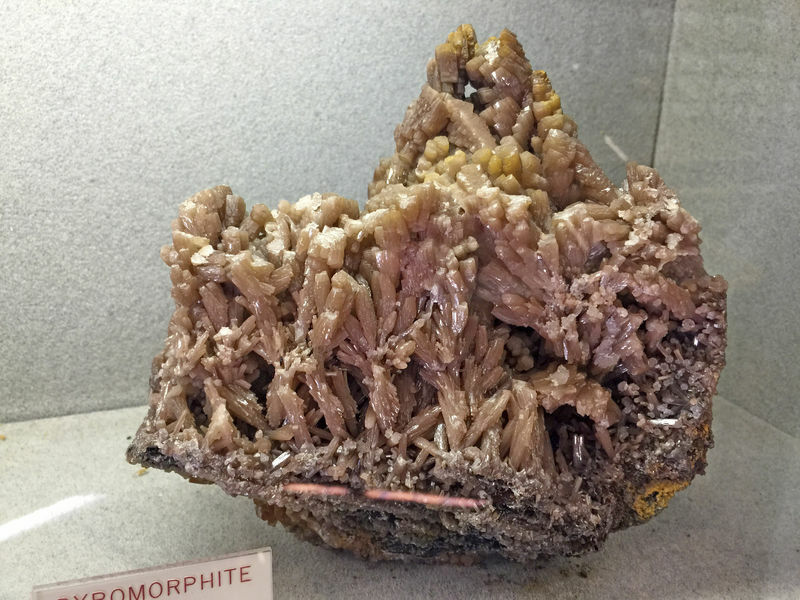 The Wulfenites from the San Francisco Mine in Sonora, Mexico characteristically has botryoidal Mimetites growing on them. 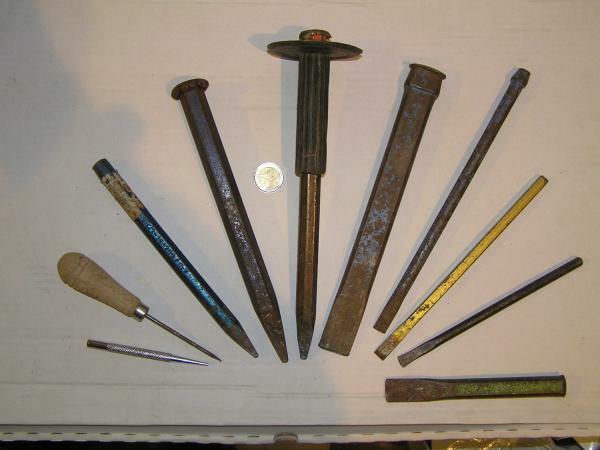 Together, these were historically collected and CRUSHED so that they could extract the Molybdenum from them. 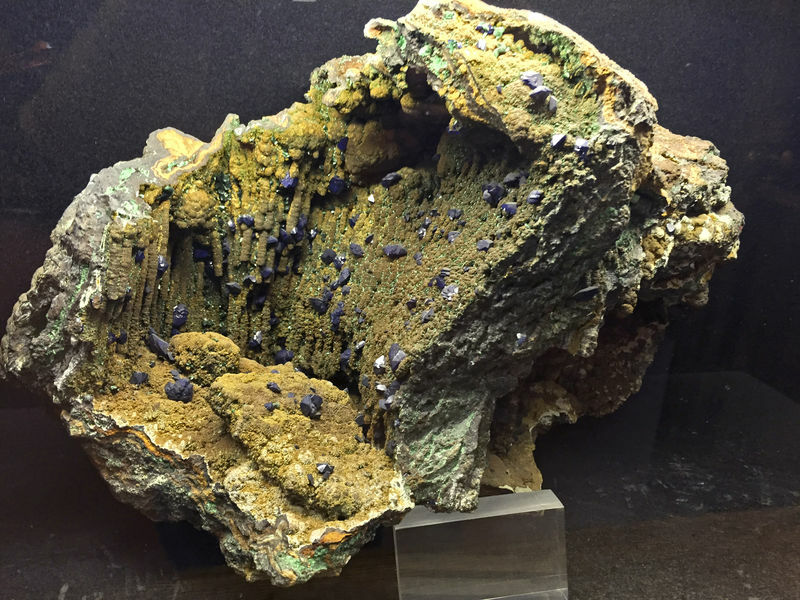 ABSOLUTELY crazy in today's world of mineral collecting. 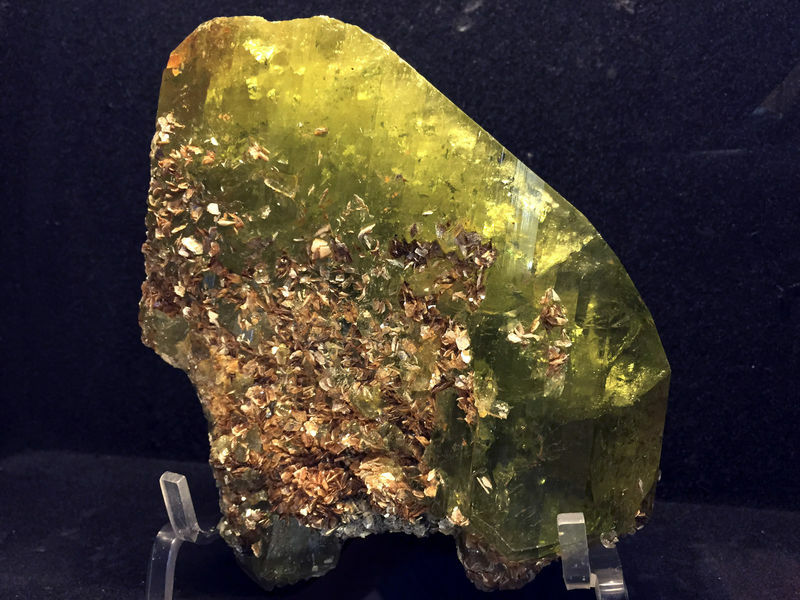 A FANTASTIC Olivine crystal from Zebirguet, Red Sea, Egypt. 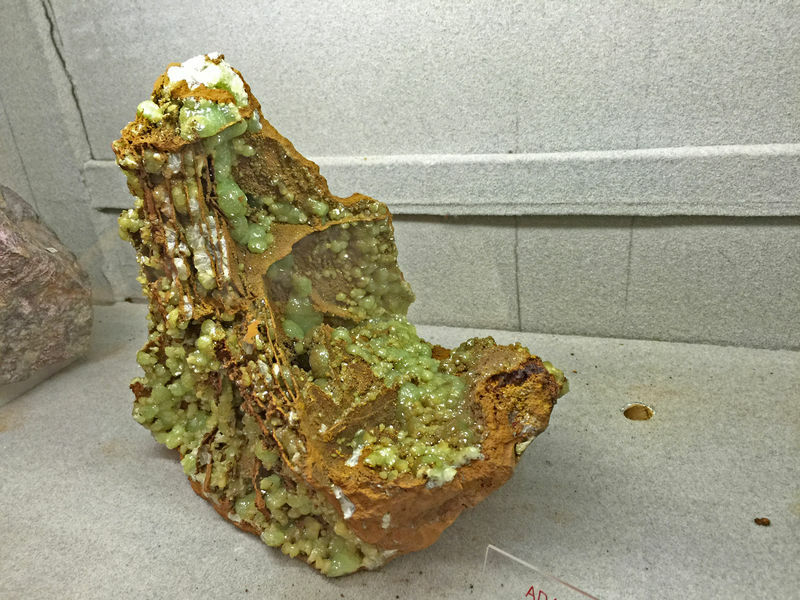 A classic, and large, Pyromorphite cluster from Friedrichssegen, Germany. As you can see from the Hubnerite photo, most of these pictures were taken using my iPhone. Here are some more overall photos of the museum so that you can see a bit more of the true beauty and classic style of this museum. 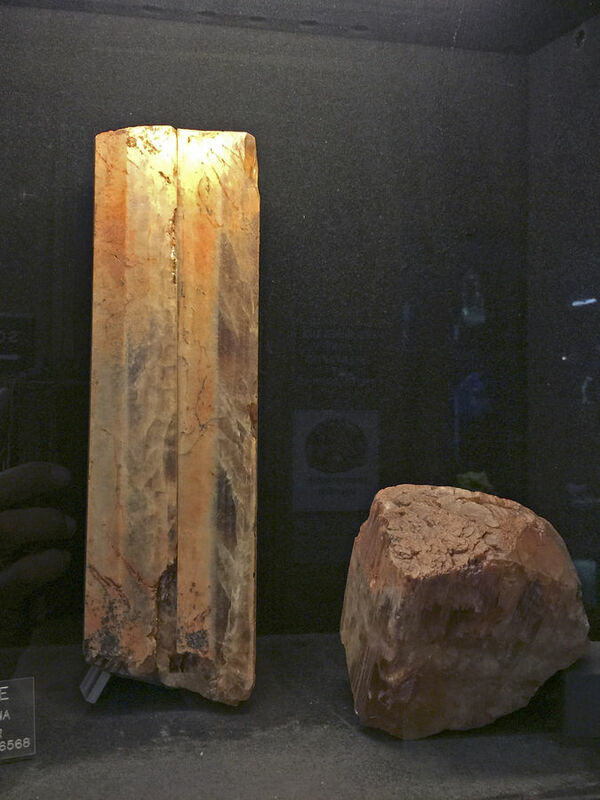 As you go up the steps, towards the 2nd floor entrance to the museum, you'll see the walls of the staircase are lined with these huge slabs of agate and jadeite. Upon closer examination, you'll see that these ARE NOT actual slabs. 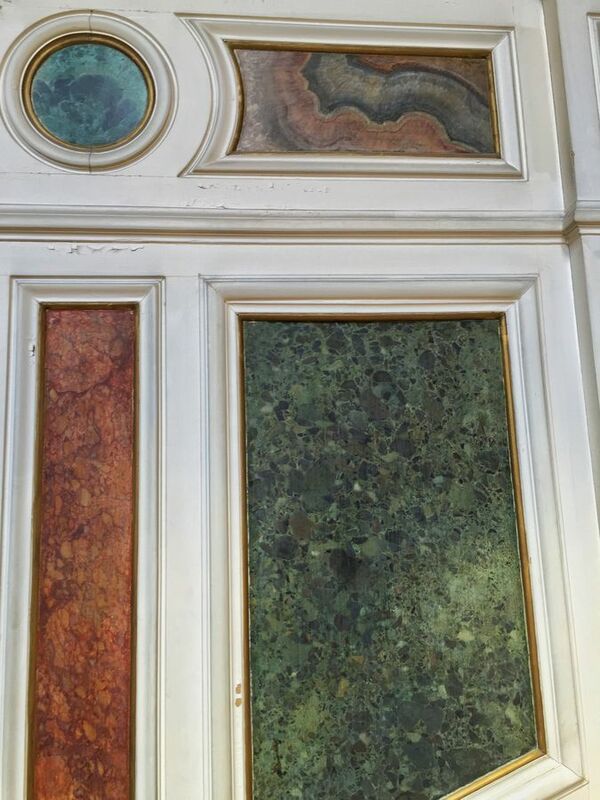 These are paintings made on the wall to look like real slabs. 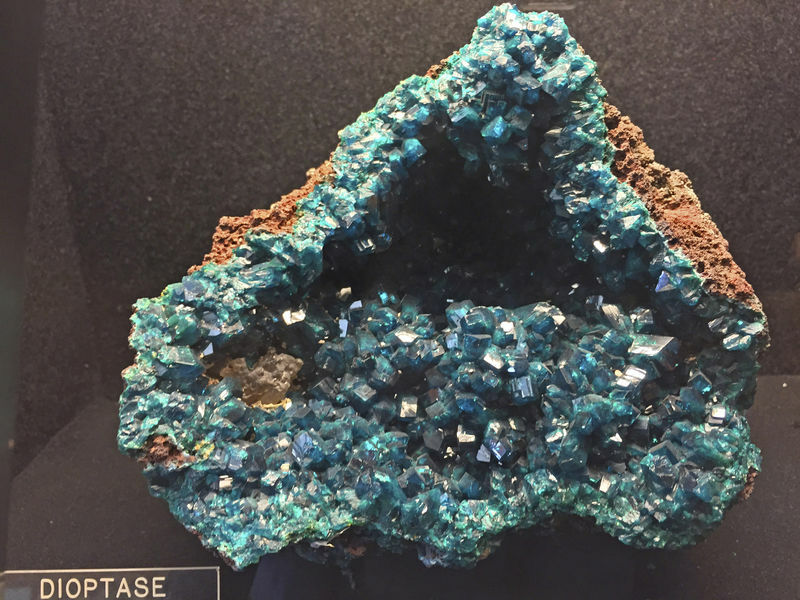 In a way, I can appreciate this dedication and love of the mineral world more than just slabbing rocks and mounting them. Imagine how much work to paint something so realistic. Having gained access to the entrance to the museum, here's a panoramic photo of the entry way. Another panoramic shot. 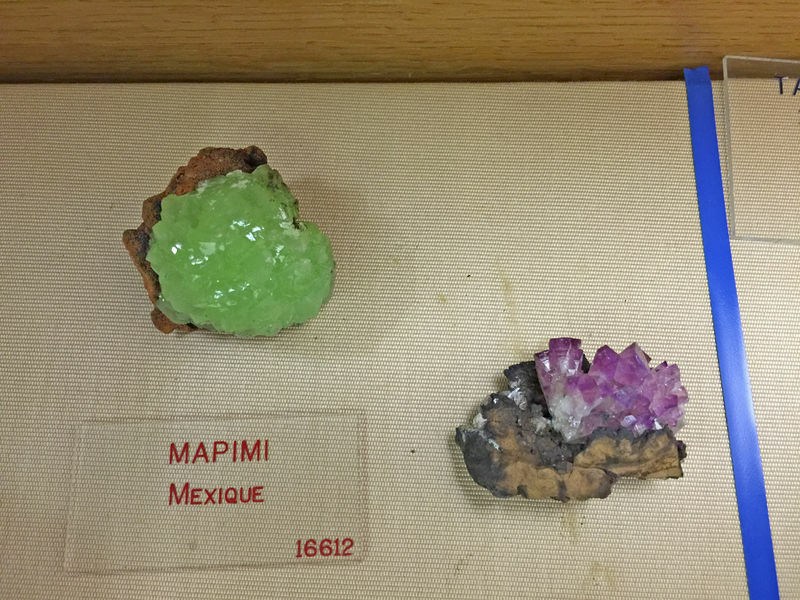 This is the far end of the museum (previously I uploaded a photo with Museum Curator Eloise Gaillou returning a specimen that had been on exhibit at the Sainte-Maire-aux-Mine Show - this photo is from the same area). 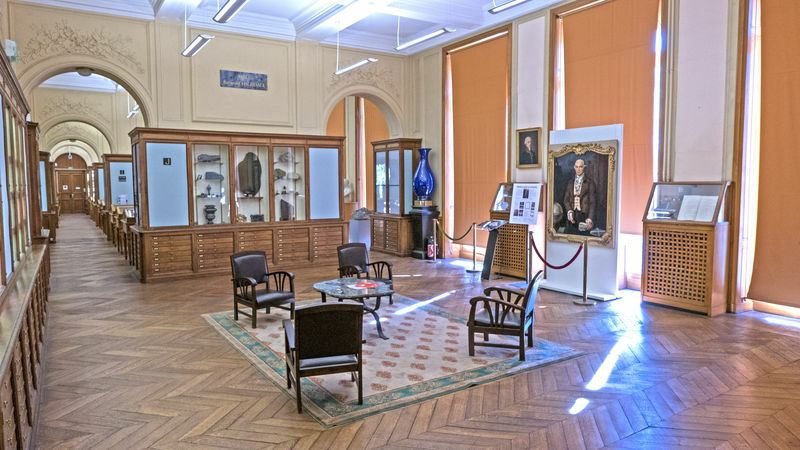 Notice the classic display cases and the rows upon rows of wall and floor cases. Absolutely beautiful!! Here is another painting dedicated to minerals and mineral collecting. 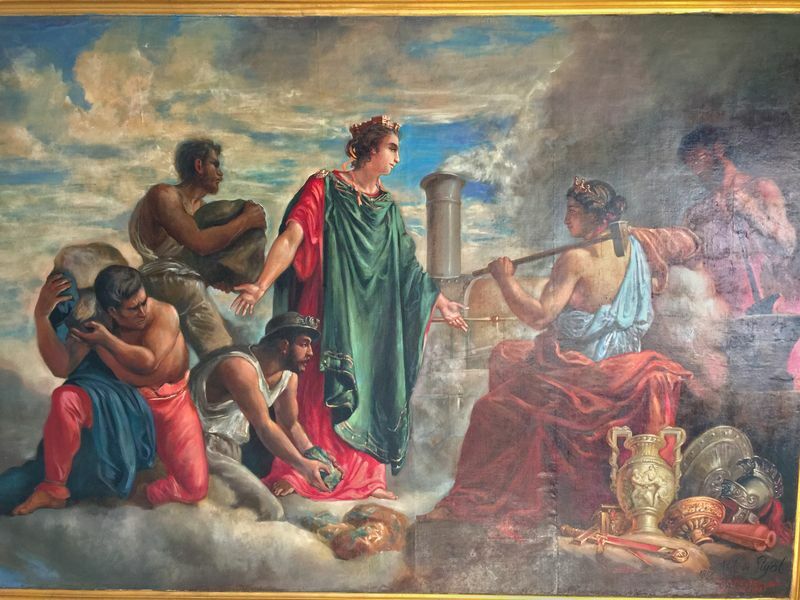 This depicts a king showing his support and appreciation to the hard work of mining and the craft of taking the elements that are mined and turning them into useful objects (armor, urns, plates, etc.). 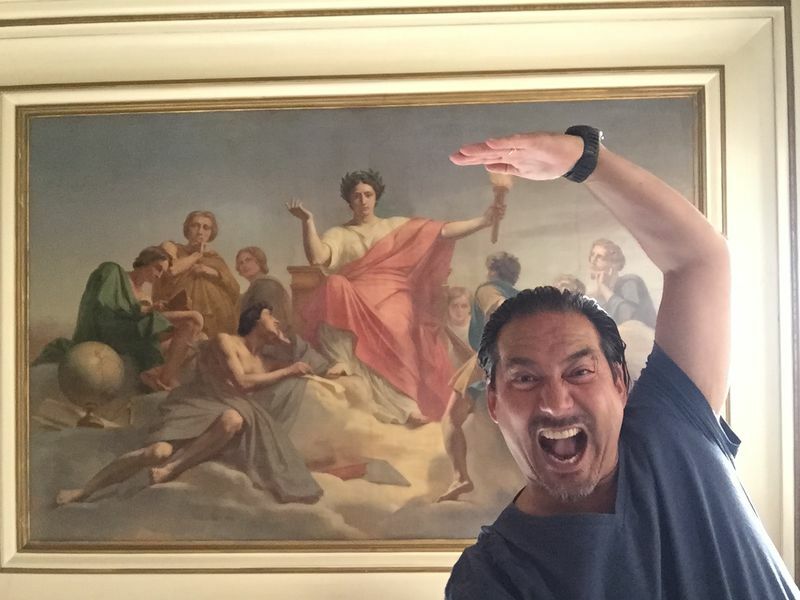 Now the REALLY cool thing about this painting is that it's on the CEILING!!!!! This is in the staircase entry area just before entering the museum. Here's another ceiling painting in the stairway area before the entrance to the museum. Yes, that's me being a goofball. Minerals from the collection starting with the letter S.
Large and pristine Sphalerite crystal from the Trepča valley in modern day Kosovo. Intrestingly, the label says "Yougoslavie" (i.e. Yugoslavia). Yugoslavia was created as an aftermath of WWII and was disolved in 1992. So there's a bit of history even in the labels!!! 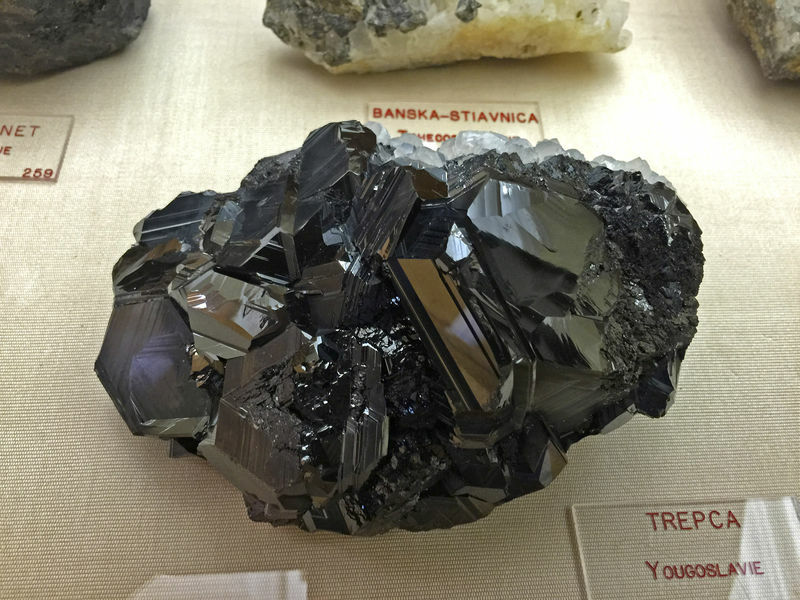 A huge Sphalerite specimen again from the Trepča valley in modern day Kosovo. 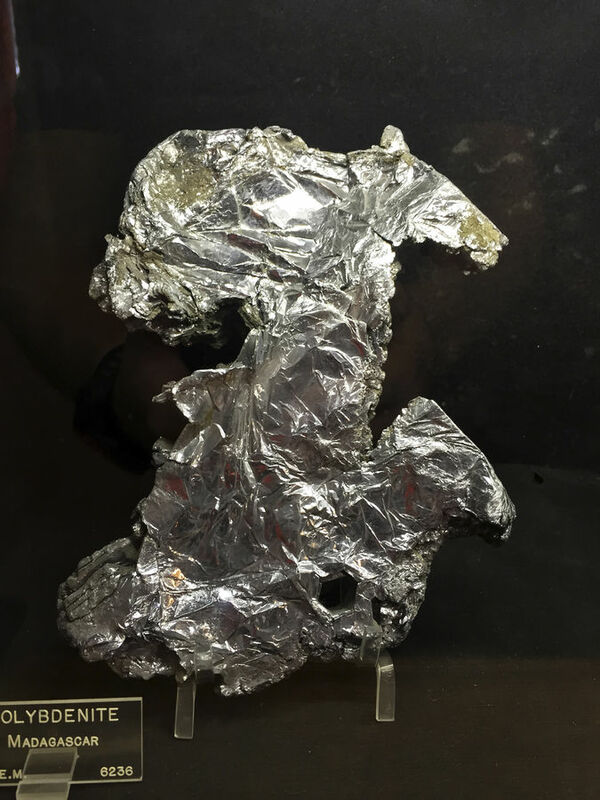 A crazy cool Stibnite specimen. 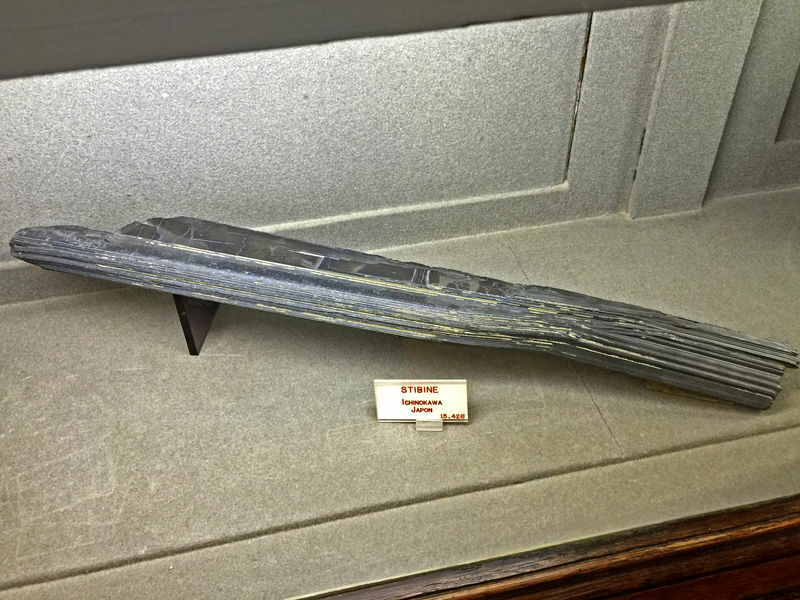 An extremely thick Stibnite crystal from Japan. 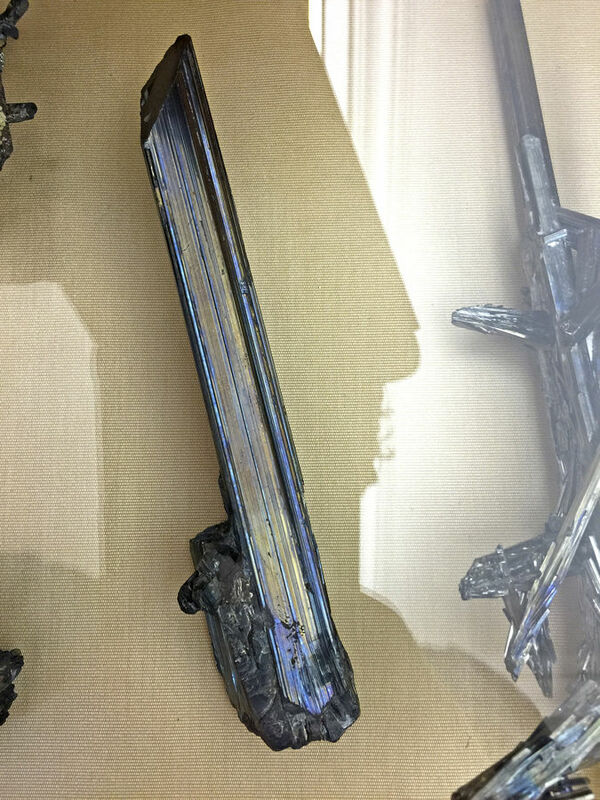 Thick and large Stibnite crystal from Japan. 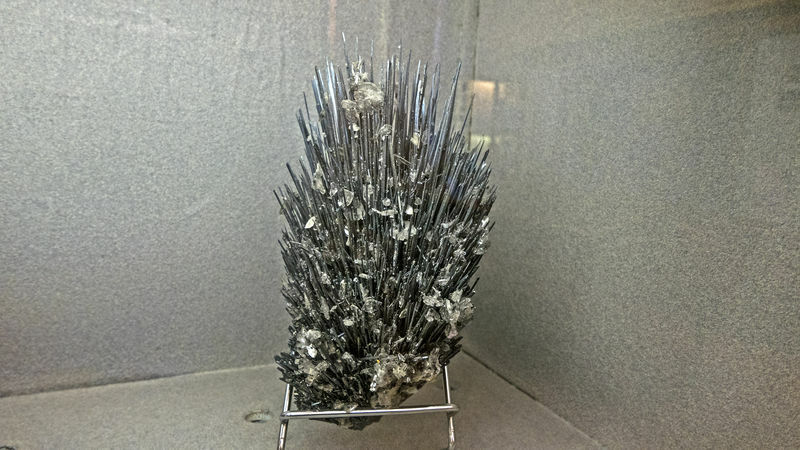 Nice Stibnite cluster from Japan. 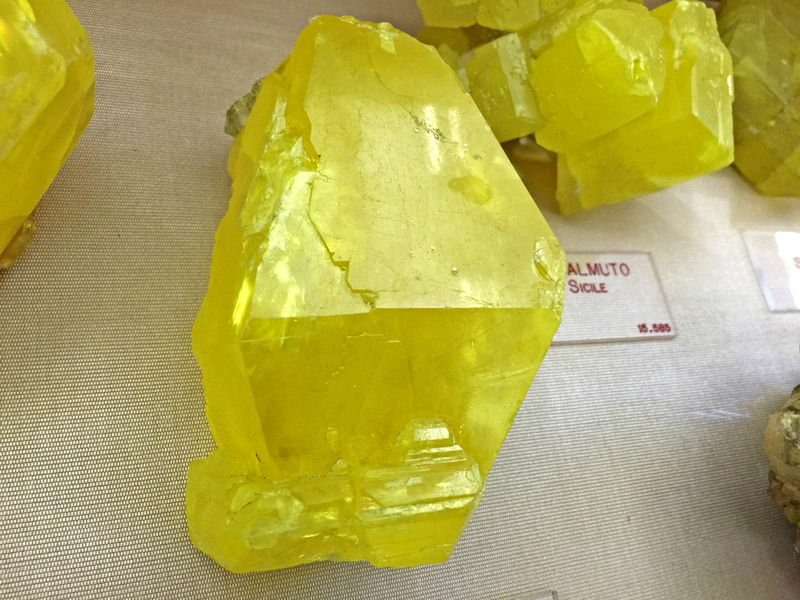 VERY large Sulfur crystal from Sicily, Italy. 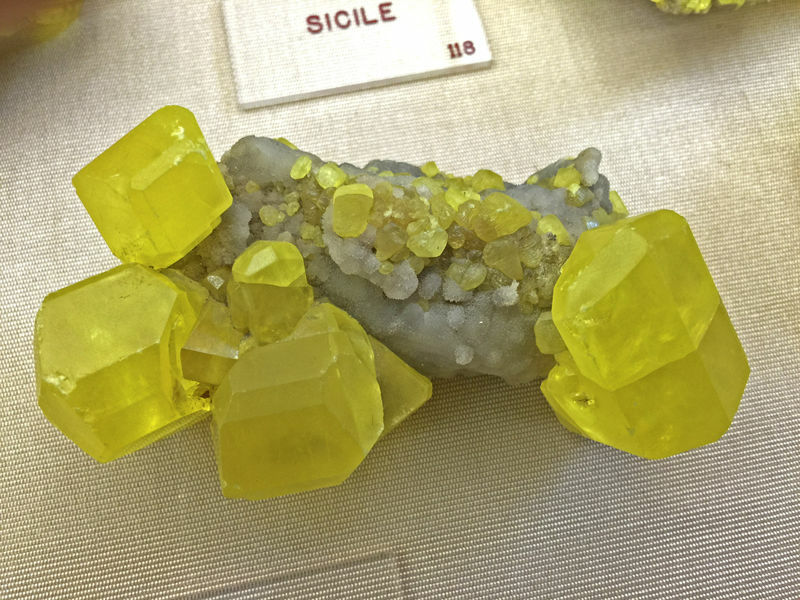 Nice Sulfur on matrix from Sicily, Italy.